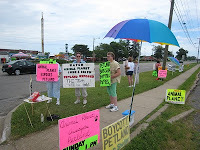 If you were not one of the 60 protesters who helped us closed down Petland Westland last month, you can still appreciate this blog and will want to join us now in Novi to take on the last Petland in Michigan! Sending out the photo of the “This Petland Location is closed” was probably the highlight of the entire year for me. Our investment in this Petland paid off and will continue to pay off as we move forward into other neighborhoods. 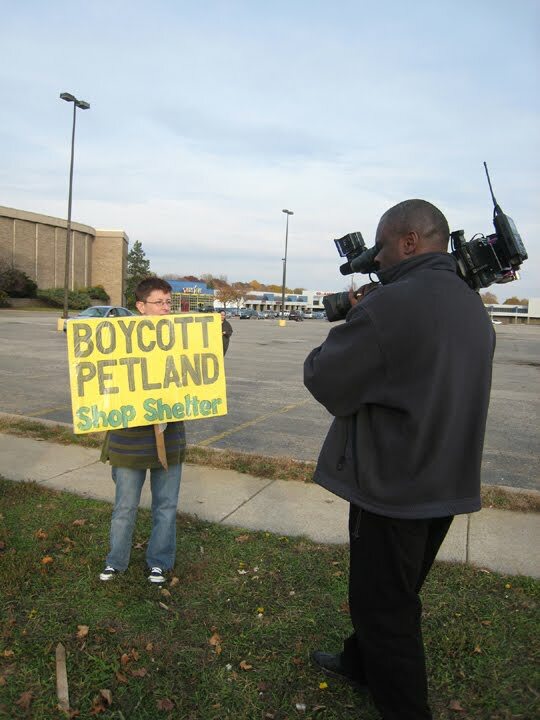 With the closer of another Petland, we not only have less mill dogs sold in Michigan, but we received more media attention from it. Check out Hometownlife’s 3-page article published yesterday about our Petland campaign and more. Many of you may not be aware of just how long and how hard we worked at this boycott. It started in January of 2009. 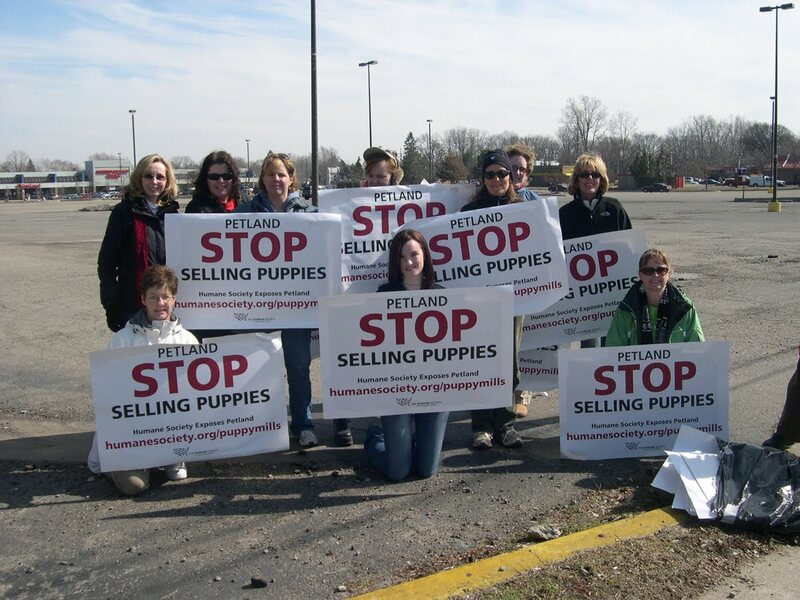 The HSUS had completed their investigation of Petland and were launching a series of rallies across the country “Ask Petland To Stop Selling Puppies”. They loaded us up with literature and signs. 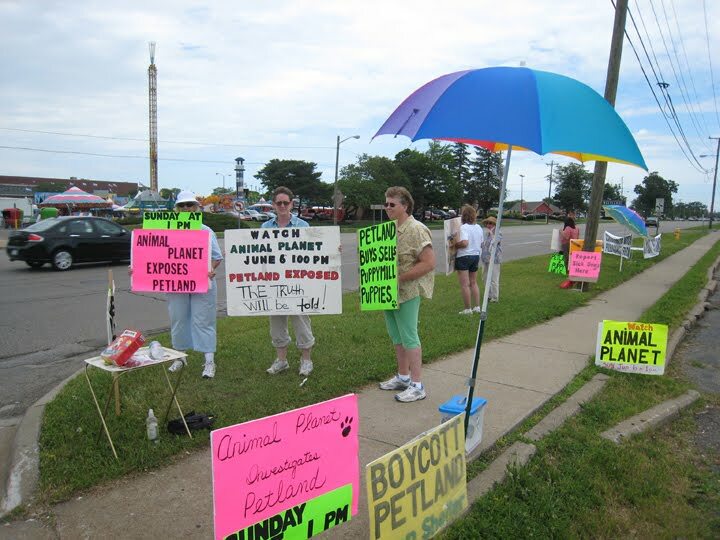 Since they did all the work, why wouldn’t we protest Petland Westland? Then we discover a group in Sterling Heights who set up rallies at that location. It closed a month later. We all won’t forget Katie, the Sterling Heights employee, who challenged our cause and later joined us with her uniform. That was priceless. 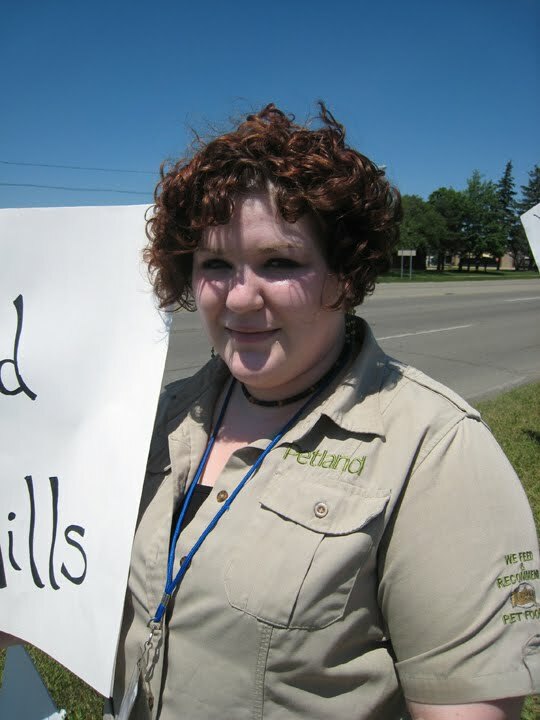 Once the HSUS stopped scheduling protests, we didn’t hesitate to keep going. We made bigger and better signs and kept the party going all summer. 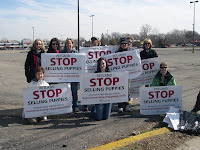 We even had our 2009 Puppy Mill Awareness Day event – Memorial Rally - there to draw media attention. Then we kept the party going all fall when Channel 7’s Heather Catallo, exposed the Petland Novi store. 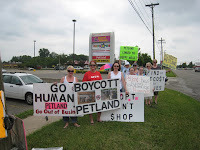 We were able to include our Westland rallies and the local shelter, HSHV, in her second story of the Petland Novi store. With all the media attention in Novi, we decided to hit the Novi Petland hard for the holidays. We did meet with the Twelve Oaks Mall Management prior to the Channel 7 story running and launching or protests. Amy also delivered a letter to the new store owner asking him to stop selling puppies. Randy Horowitz is the guy now on our radar. 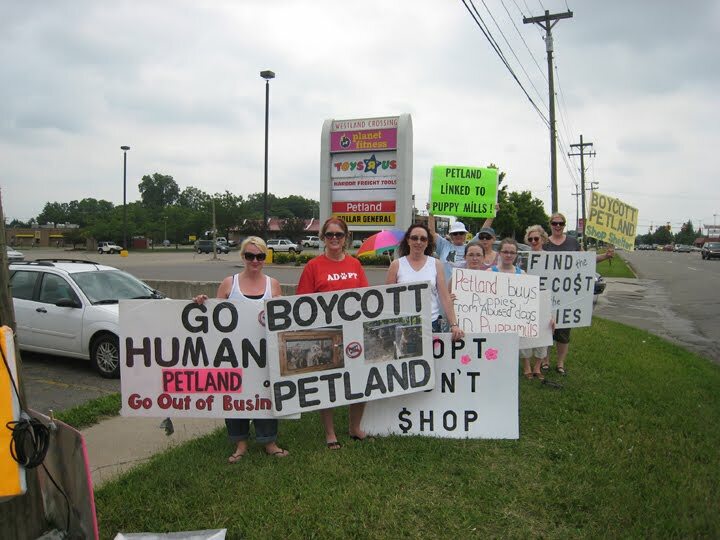 We took a break at Petland Westland in January and February while we pounded Novi with more protests. During that time we had discussions about how to be most effective at Petland Westland. We need to reach out behind the sidewalk and contact organizations in the city. We notified the Chamber of Commerce, and Animal Control. No help there. Everyone voted we keep going with the protest starting in the spring. I learned from a group in California that rallying every Saturday for 6 months straight with at least 10 people is the best approach. Saturdays are their busiest day of the week. So that is what we did. We hit them EVERY Saturday for 5 months through August. 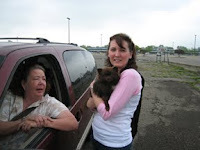 During this time we had more help from the HSUS’s campaign. They ran their investigation through Animal Planet. That really fueled our rallies and gave us more to show the public. We also issued a Press Release exposing their main broker Abe Miller. 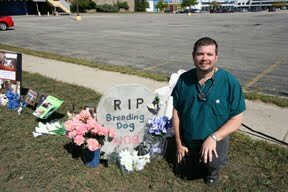 In 2010 we started drawing in more sick dogs cases- a total of thirteen just from our rallies. There were over 30 complaints collected in total form other agencies. We were able to provide the families a list of places to file complaints and then added them to our long list of online complaints. We kept their BBB rating at an F! After the hot August rallies, we decided to take a break so we could kick-off The Family Puppy Campaign in Flint for PMA Day. 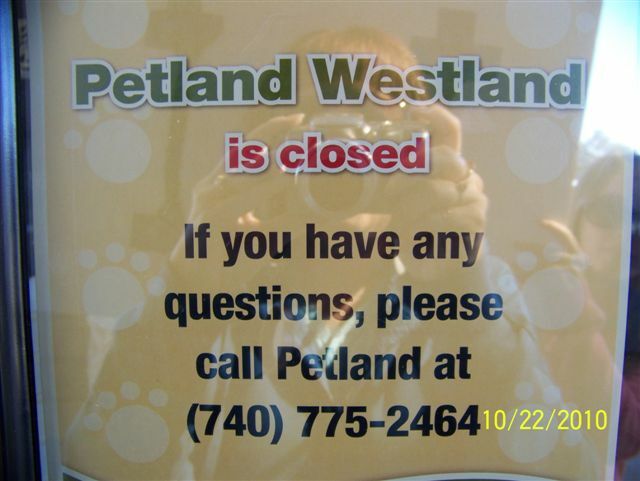 While everyone was ready to come back to Petland Westland for the holidays, we quickly found out they were waiting for us to leave so they could close their does privately. Please join us in Novi for the Holidays!!! The last standing Petland has two choices: go out to business or switch to adoptions only. We already have the holiday rallies on the calendar.